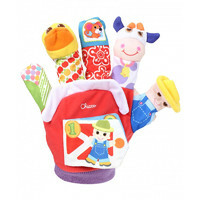 With Chicco’s colourful finger puppet glove you can bring the funny farm to life with only one hand. Tell your child amazing stories about the little duckling, the cow, the mouse and the farmer. Your little one will love to see you imitating the animals and people featured on the glove. There are no limits to your phantasy. The glove features many interesting elements that crackle, squeak and rattle happily and thus contribute to the exciting and fascinating stories you tell your little one with this finger puppet glove. By using the little book on the palm of your hand, you can teach your child how to count and to name animals. Getting to know numbers and animals in a playful way with Chicco’s finger puppet glove will be a fun experience that will delight and entertain your child every day.